Wood has been around for a while, but it is still one of the most common building materials for decks, siding, or in the case of a log home, entire walls. Why is wood still on top? Because wood gives your home a classic, natural look (not to mention it is easy to work with and highly customizable). If it is not properly taken care of, however, wood can become an eyesore for your home. Wood is subject to dirt, grime, algae, and even rot, so don’t let your wood surfaces fall into a state of disrepair. For regular deck cleaning and maintenance, you can simply use deck brushes and a garden hose, but when it is time to perform a heavy cleaning or restoration, a pressure washer is the way to go. 2. As always, test your surface- Before you go spraying down the middle of the deck, test a small out of the way area first. You want to determine you will not damage the wood before you continue cleaning. 3. Watch for signs of excess pressure- If you are deck cleaning and a fuzz-like effect starts, this is a sign that there is too much pressure being applied. 4. Use the right nozzle- Don’t use anything more focused than a 25 degrees nozzle. To further protect against damaging the surface, hold the wand out a little further than you usually would. 5. Use a water broom- To speed up the process of deck cleaning, you can use water brooms. A water broom is a pressure washer attachment that will help you cover a larger area at one time by placing several nozzles along a bar. This bar will have castors attached to the ends to help you keep it at the same height over the surface of the deck while you are cleaning. You may want to use a slightly lower pressure when using a water broom attachment since it will be closer to the surface of the wood than the wand. As with a wand, make sure you are using the proper nozzles. 6. Don’t go against the grain- Always work from the bottom up when deck cleaning and spray along the grain in even sweeping motions. Just as if you were painting, you can overlap slightly to make sure you do not miss a spot. 7. Use a detergent for heavily soiled areas- If you are cleaning a heavily soiled deck, a pressure washer detergent may come in handy. You may have to apply this ahead of time and let it set in 10-15 minutes before using the pressure washer. 8. Know when to perform a total restoration- If a deck is left long enough without proper upkeep, total restoration may have to be done. 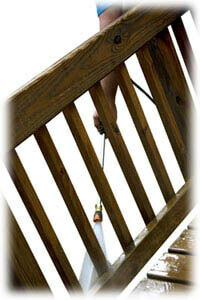 This will include deck cleaning with a pressure washer, as well as finishing with new paint, stain or sealant. If the old finish is flaking off as you wash, it is time to restore the deck. 9. Test the sealant- If you are unsure about a sealant, test it with water. Sprinkle a couple of drops on the wood surface in question, and watch to see if they are soaked up or not. If the water soaks in, it needs to be replaced or you have gotten all of the sealant off. If the water beads up, then there is still sealant on the surface. 10.Do not increase the pressure to strip old finish- When you notice old paint or sealant flaking off while you are pressure washing you may be tempted to increase the pressure to take the rest of it off so you can refinish the deck. Do not do this as you can damage the wood. Use a wood stripper to prepare an old deck for restoration. Tips on how to effectively clean brick with a pressure washer without damaging the surface. Cut your cleaning time with a water broom.